When you are in your 20s and 30s you can get away with much more. But as you approach your 40s and 50s suddenly too much makeup...or too little aren’t looking so good. Using the wrong foundation: Forget the rule that says your foundation must match your complexion exactly. Skin becomes paler with age so if you were to use a foundation that matched you 100% you could look pasty. Put some life back in your skin with a slightly ‘warmer’ tone, a shade just a bit deeper than your old one. If that is going to deep, than mix the two together to give you the desired shade. And still speaking of foundation, remember that as we get older and our hormone levels drop our skin loses moisture. If you use a medium to full coverage foundation, which have a lot of pigment… and pigment means more powder which will absorb moisture, then you have color that cakes and creeps into your fine lines. What to do? First, make sure you exfoliate religiously to avoid dry flaky skin that the foundation will stick to. And sheer out your foundation a bit with a drop of moisturizer to make it less likely to settle into lines. Cakey Concealer: To keep concealer from drawing attention to wrinkles, apply it only to the inner halves of your eyes to cover up darkness. Pat it in gently, using your pinky finger for the lightest touch, from the inner corner only to about half way out. Skip using the thick traditional cream kind and instead try one of the new brush-on highlighter pens with some light diffusers added to them. And make sure you use the right color…a touch lighter than your foundation color. Go to light and you look ashy. 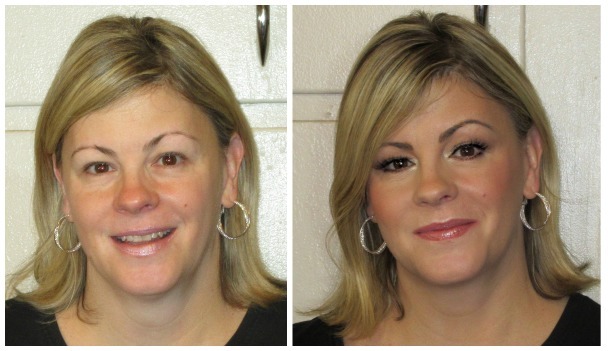 None or overdone Eyebrows: Brows frame and define the eyes and face and help you look more youthful. But don’t go overboard and draw on a harsh overdrawn one. You need to use a brow pencil, it is designed to be hard but go on softly using short little strokes starting from front and working your way to the tail end. Overdone Eyes: Piling on color in hopes that it will stay all day is not the way to go. A good eye primer is the first step in helping your eyelids have an even smooth base upon which to now add your shadow. A primer not only helps color adhere better but also helps hide veins and any discoloration of your lids. But remember to apply just a tiny thin sheer coat…any more and the excess will make your eyes look crepey. Muddy Eye shadow: If brown and bone are your go- to eye shadow colors you should note that brown has yellow or red pigments in it, and either can make your eyes look tired. Bone can be to light now to cover any skin discolorations especially if not using a primer first. Jewel tones cancel out reds and yellows, and choose taupe’s over browns. Closing up your eyes: Only apply liner to top lashes. Using a pencil to line the top of lashes...thinner along the inner eye and getting slightly fuller as you go towards the outer corner. A good universal color would be charcoal or eggplant. Save the black for evening…too harsh for daytime. For underneath your eye use a softer color and line softly using eye shadow, not a pencil…and remember to smudge and blend. NEVER apply liquid liner to bottom of lashes. Curl your lashes for a more youthful and awake look. And because mascara can weigh down lashes they may not hold a curl as they once did when you were younger. Try a ‘curling’ mascara to see if that helps otherwise use waterproof. Now waterproof is drying to lashes and much harder to get off so be careful to condition your lashes at night after washing your face and make sure to use a good eye makeup remover first to remove the mascara before washing your face to avoid rubbing and tugging on your delicate eye area and causing your lashes to fall out from all that rubbing. Bad blush: An instant trick to lift the cheeks is to apply your blush to the ‘apples’ of your cheeks. Go with a warm, rosy color for fair and medium skin tones. Or a brownish berry for darker. Don’t go to bright on the blush. Dark lipstick: Lips lose plumpness over time and a deep lipstick makes them appear thinner. To dark a lipstick and you look harsh. The whole point of wearing makeup is to appear fresh, youthful and soft. Remember, light brings forward and larger. Dark recedes, makes smaller ...so if you want your lips to look plump and full choose a lighter color and add a touch of clear shimmer lip gloss over your lipstick to catch the light and give the allusion of pump lips. Or try a sheer golden gloss over to add dimension. Lipstick Bleed: Lip liner is the way to go to stop the bleeding of lipstick. Also don’t apply lipstick directly from the tube and apply it with a lip brush. Extra lipstick migrates, especially as the definition of the lips boarder softens with age. Applying color straight from the tube give you to much product than what you need. Instead, dip the brush into your lipstick and dab a little on the center of your lips, which is the fullest, and then spread it to the corners which are the narrowest part. Also, remember to apply your foundation to your lips as well first so your lipstick has something to cling to. This will add to the staying power. And lastly, remember that ANYTHING that is severe…. a lipstick...dark, heavy liner…to dark hair color against your skin…WILL AGE YOU!! !